I worked as a process engineer at Witteveen+Bos on water treatment and sanitation projects. 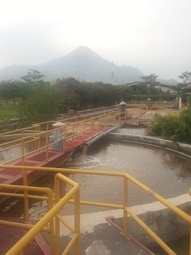 In Jakarta I worked on (on-going) projects regarding water treatment (both drinking water and wastewater) and sanitation. With my background as Civil Engineer I have broadened my experience on other water projects as well. I am an analytical person who works structured and systematic. Interdisciplinary thinking is an important aspect of the work I am doing at the moment at Witteveen+Bos. I have good writing and communicating skills. During my study of Sanitary Engineering I focused on wastewater treatment processes. At Witteveen+Bos Consulting Engineers I mainly worked as process engineer on wastewater projects. Education: Master Sanitary Engineering (part of Civil Engineering) at Delft University of Technology, Bachelor Civil Engineering at Delft University of Technology. During my Masters study at the Delft University of Technology and during my professional career at Witteveen+Bos I had the opportunity to visit several countries during both study trips and internship.